We are hosting and organising several upcoming events next year such as 2014 Genocide Memorial Day, Islamophobia Awards, Summer School on Black Europe Program 2014 as well as Assata-Tupac Liberation School and SOAS2. Keep checking back on our website for further updates and news on these events. Very interesting blog on the misappropriation of the Great War is something we should all resist, argues Arzu Merali, particularly the trend to equate remembrance day with Islamic history. Idara-e-Jaaferiya forced to close for foreseeable future. The Islamic Human Rights Commission condemns the violence which marred Ashura commemorations on the night of Thursday 14 November at the Idara-e-Jaaferiya in south London, forcing its closure for the foreseeable future. ‘IHRC Know Your Rights’ app launched, download it now! 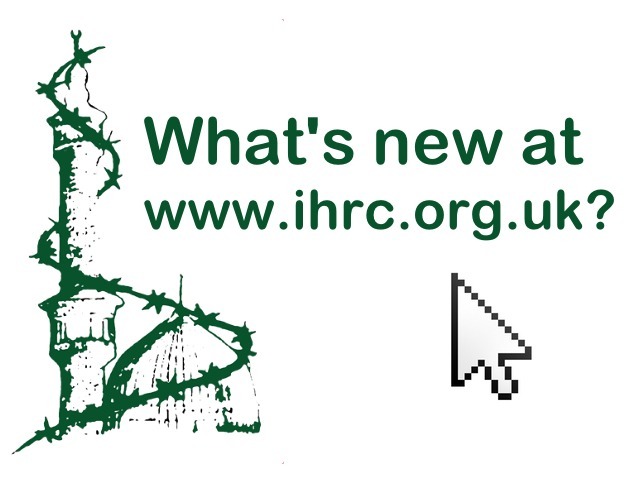 IHRC has launched apps for Apple and Android phones to inform people of their rights in respect of the controversial Sections 7 and 8 of the Terrorism Act. Ahlulbayt Society which plans to hold an Ashura awareness campaign. At Nuffield Theater lecture room A, Programme will be from 6-8pm on Sunday the 24th of November. With th audience compromising of both Shia, Sunni and non Muslims. The lecture topic we would like to have is on Imam Hussein and Justice/Human Rights which will be followed by a Q&A session. Talha Ahsan is a British-born poet with Asperger syndrome extradited to the US in 2012. October 5, was the day Talha was put into a black van from HMP Long Lartin and extradited to a US Supermax prison, now spending a year in pre-trial isolation in solitary confinement. Theresa May boasted “wasn’t it great to say Goodbye to Abu Humza & those 4 others” conflating cases as a cheap trick. Find out more about Lynne and join the campaign for her release. IHRC is urging campaigners to contact the prison where Lynne Stewart is held, and to Lynne herself to show support to this tireless campaigner for justice. Don’t forget this notorious case of US injustice. Dr. Aafia Siddiqui languishes in a US jail after a harrowing ordeal of kidnapping in Pakistan, detention in the notorious Bagram airbase, a prolonged period where no-one knows where she was followed by a sham trial and sentencing, over a period of almost a decade. More information on her case can be found on the Justice for Aafia page. Find out more about Mumia Abu-Jamal and join the campaign for his release. The misappropriation of the Great War is something we should all resist, argues Arzu Merali, particularly the trend to equate remembrance day with Islamic history. Question of whether Muslim women being imposed of wearing the burkha in the UK, has re-emerged. A roundup of articles and media. Encountering Islam – Takes the reader on a journey from the halls of academia to the images of popular culture, from the events of the distant past to the headlines of the day. The Idols Will Fall/ Bahmanpour – This is the story of the Sleepers of the Cave. The Idols Will Fall is a unique presentation of the miraculous story of the young men referred to both in Christian historical literature and in the Qur’an.